My mellow state of mind has been tested again! On Friday, one of my childminders rang me to let me know that her daughter had been diagnosed with chicken pox. She gave me the weekend to think about whether or not I wanted to send Lara to her this week. My first thoughts were for Lara. Should I be worried for her? What does it mean for her? My worrying was short-lived. She's a generally healthy child and we'll be there for her when she needs us. Chicken pox may be miserable for them, but in most cases, it is not a serious virus. Then my mind turned to her other childminder – she's 5 months pregnant. I spoke to her that evening and she seemed remarkably mellow about it. Chicken pox during pregnancy can be very serious. Thankfully, she has already had the virus and has been given a blood test to ensure that she has developed immunity to it. It is still possible, as an adult with immunity, to develop shingles (a variation on the same virus) but this is rarely harmful during pregnancy. This settled my mind a lot as it meant that I would not be presented with a childcare void. Finally, I worried about my husband. He's never had chicken pox and I've been warned that it can be a lot more unpleasant as an adult. In fact, I can still clearly remember seeing my own Dad when I was a child, he having been laid up in bed for a fortnight with the virus and having not shaved – the sight was the stuff of nightmares! Anyway, I have decided to remain calm. Lara spends every afternoon with school children and every day with their younger siblings. She goes to playgroup, swimming lessons and family friends. Lara is going to get the virus sooner or later (in fact, 90% of UK adults will have had the virus as a child). In all likelihood, if she was going to catch the virus this time around, she has probably already caught it (the time taken from infection to the spots showing can be as much as three weeks, and it is most infectious a couple of days before and after the spots appear). There is no way that her daddy is going to avoid infection either, without moving out for the next 9-10 years (!) it would be pretty much impossible for him to avoid it. I ache. My arms feel like I did a mammoth session at the gym. My lungs feel (in my sister's words) as if they have been cleaned out by a Brillo pad. I have bruises all over my legs and a particularly impressive shiner on my left knee. My injuries were sustained yesterday when I decided to be brave and take Lara into central London. Lara and I joined a group of mummies and daddies for a picnic, smack in the middle of the city. Having been a commuter for two stints during my career so far, I can ordinarily 'do' central London with my eyes closed but this was the first time that I had been into the city with a baby in tow. I was nervous (and even considered not going) but I bit the bullet. My troubles started before we had even started our journey. We had a swimming lesson first thing in the morning so with a bit of fore-thought, I had already bought my train ticket and car park pass to save time. The changing room at the swimming pool is tiny, wet and stressful on a normal day, not to mention when you're in a rush. We changed in record time (partly due to the fact I left barefoot and with my hair all over the shop) and left the pool with 13 minutes to catch a train from a station 2 minutes drive away. Plenty of time. I got to the car only to discover I had lost my keys. I plonked Lara on the ground and ran back to rummage around on the floor of the wet changing room. Then, after about a 2-million-point manoeuvre to get out of the tiny driveway where I was parked-in by a herd of 4x4s, I drove at break-neck speed to the station. Arrrgh, the car park is on the other side of the level crossing and, naturally, I got caught at the crossing and had to wait for a train going the other direction. After the barriers lifted, I had 4 minutes before the train was due. I found a space in the car park about half a mile away from the station, strapped Lara into the buggy, put a bag over each shoulder and sprinted for the station – I could hear the train approaching. I reached the station as the train pulled in. I grabbed the buggy in both hands and then hauled it up the stairs and over the bridge to the other side. A very lovely man ran up to help me but as we descended the bridge on the other side, the doors to the train closed. In a frenzy, I ran down the platform towards the guard, screaming at him to open the doors. He did! Phew, we had made it! The journey was fine. Lara loved it but it took most of the journey for my heart rate to recover... Just in time for the arrival at Waterloo. We left the station via a little-used exit which involves an escalator and a small number of stairs. Next, Lara got to experience her first bus. Buses in London are pretty easy with a buggy as most of them have lowered doors and a space to park the pushchair. Our bus was packed. We ended up standing in the corridor with grumpy people pushing past every few seconds. The buggy was all over the shop and kept bashing into my knees (hence the bruise). When we got to our destination it was a relief to get out and walk. I shall skip over the next few hours. They were mellow, sunny, fun and relaxing. Good Stuff. When Lara and I left, she hadn't had a real nap so I decided to walk back to Waterloo. The half-hour stroll in the beating sunshine through the back streets of London was wonderful. It brought back lots of memories of my working days and achieved the goal of getting Lara off to sleep. As I strolled back over Waterloo bridge I started thinking about how to get back into the station. I know a million different ways into the station and could only think of ONE entrance to the station from the bridge that didn't involve stairs, escalators or both... and that one entrance would have involved walking three sides of a square along the taxi route. I'm pretty sure there must be a wheel-chair friendly or buggy-friendly way in but I couldn't think of it so I decided to use the same, little-used route that I had come out of seeing as it just involved a small number of stairs and an escalator. I carried the buggy down the stairs without waking Lara. We walked under the subway and then I swore, very loudly. The fricking 'up' escalator was out of order! By this point I was so close, I was sweating like a... who knows what... and I just wanted the journey to be over. I grabbed the buggy and took on the escalator by foot. It felt like the longest escalator ever known to man. About 1/3 of the way up, the lactic acid in my arms and legs started to kick in – I looked up and saw there was a long way to go. I had to push myself to get up those stairs. I was driven only by the fact that with each step, the light got brighter and I knew I was closer to the concourse. I almost collapsed when we reached the top. The adrenaline pushed me to the train, I flolloped (yes, this is the exact word for what I did!) into a seat and Lara looked up at me and gave me a sleepy grin! It was all worth it. 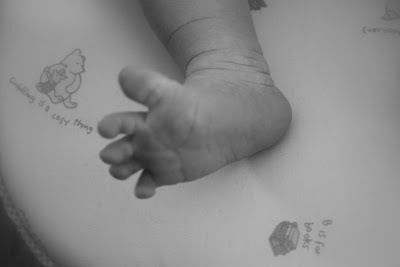 I am entering this blog post into the Tots100 Blog Hop - Baby's First Day Out. Thursday would normally be my day of the week to get stuff done, including writing blog posts. But, as it was so sunny, I trekked into the centre of London (a story I shall tell you about some time soon) and had a picnic in the sunshine. Top Stuff. And so, having had no time to write, I thought I'd just indulge myself and post some more scrumptious pictures! Enjoy. Welcome back to my 'relatively-wordless' week. Here are some pics to demonstrate how guilty the members of the mellow household are when it comes to the seven deadly sins - we are particularly good at 'sloth' so this is the theme for my Gallery post for the week. Lara suffers from mild ezcema on her arms. In an attempt to reduce the irritation to her skin, we have decided to only use bath products that are free from SLS/SLES, Parabens and Phthalates (if you don't know what these are, there is a complete guide to common cosmetic ingredients on the Halos n Horns website). Halos n Horns was launched by a mummy whose child suffered from ezcema and who felt that as parents, we wash our little angels to git rid of all of the nasties, not put more on! The Halos n Horns baby bath is a bubble bath which is so gentle that it can be used as a body wash and hair wash as well. 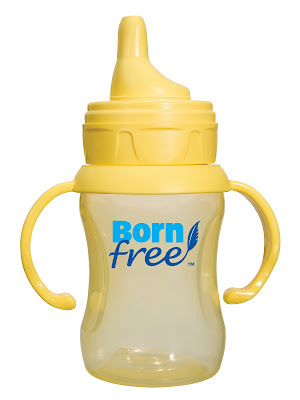 As an all-in-one product it is a great option for taking on holiday as it saves you having to pack separate bottles and trust me, when you travel with a baby, you need to save all the space you can in your suitcase! I'm looking forward to taking our Halos n Horns baby bath with us when we got to NY in June. The baby bath smells fantastic. It took me a while to work out what it smells of, but I think I have got it now... Cherryade! Lara seems to enjoy it, and certainly doesn't complain when we use it to wash her hair and body. The dry skin on her arms often comes up very red after a bath but it seems to be a little more calm when we use this to clean her. The baby bath doesn't froth very well and takes quite some effort to lather up but this may just be because we live in a part of the country where we suffer from astonishingly hard water (which probably contributes to Lara's ezcema too). The Halos N Horns baby bath comes in a 200ml tube and costs around £3.29. Halos N Horns also make two different combined shampoo & conditioner products, a body wash and a toothpaste. Their products can be found in most major supermarkets. They have a great website at http://www.halosnhorns.co.uk/ where there are competitions, tips for having fun with your kids, a discussion board and children's activities. You can also request your free 'Little Book of Holiday Fun' which is a great booklet packed full of holiday tips and activities for children of all ages. What time do you send your kids to bed? What time do you go to bed? How has your bedtime changed since becoming a parent? In recent weeks I have noticed myself still up and about as midnight approaches. This time last year that would have been unheard of. Before becoming a mummy, I would normally be in bed before 10pm and asleep soon after that but now my daily schedule has changed; If I went to bed that early, I wouldn't get any time to myself. For a 10-month old, I believe Lara goes to bed quite late – usually sometime between 8.30 and 9.30pm but regularly as late at 10.30pm. I don't enforce a bedtime, we just follow her lead and let her wear herself out (thus ensuring an uninterrupted night for us!). As she gets older, we may look to try and change that pattern but currently is suits us just fine. On a weekday, we normally get home from work/childminders shortly after 6pm. We get a little bit of chill out time with Lara to ourselves both before and after dinner. I don't feel any rush to get Lara into bed – I enjoy the short amount of time we get with her on a weekday and would probably reconsider my choice to go back to work if she fell asleep immediately after her evening meal. After Lara goes to sleep, myself and Mr. B. get some time to ourselves. This is the time when we can be grown ups, watch grown-up TV, talk about grown-up stuff, drink grown-up drinks and enjoy each other's company! Sometimes the need for grown-up time is so great that we can find ourselves still up and about far later than we had planned (and much too late for a 'school' night!). I'm sure our schedule will change over the years, but right now I think it's perfect. Last week I told you about how we are starting the not-so-mellow process of putting our house on the market. I have been thinking a lot about the things I'll miss about this house, our first house together... and the things I most certainly will not. I won't go as far as to say that the neighbours are the ONLY reason why we are planning on moving, but they are certainly a contributing factor. I hope they won't scupper our chances of a good sale. I'll apologise now on behalf of the neighbours (I know they won't apologise on their own behalf). I'm sorry for the lack of privacy caused by the naked smoking man who stares straight into the living room as he drags slowly on his cigarette before flicking the remains out of the window and disappearing into his naked world. I'm sorry for the racket made by the hundreds (it feels like hundreds) of kids who spend their entire school holidays camping in the tiny flat behind you with their elderly grandfather – they may be just about the most unpleasant people I have ever come across. I'm sorry for the randomness of the old lady across the path who likes to set fire to her living room quite regularly. And finally, I really can't apologise enough for the noisy family across the way whose taste in music (Celine Dion and T'Pau turned up to the max) you will have to endure, whose arguments you will feel like you are part of, whose noisy and offensive children you will grow to hate, whose lights are bright enough to light up your own house all night long ( I recommend a pair of blackout curtains) and who feel it necessary to pressure-wash the public footpath outside their house for several hours every weekend. I'm sorry. Rant over. I hope you like what we've done with the place. Actually, you're probably very unimpressed, that's the way these things go. Feel free to paint over our choice of wall decoration and replace the carpets and, if you really must, rip out the kitchen and the bathroom on which we spent so much money to make 'ours'. Just remember, when you are decorating, to always expect the unexpected – when we started decorating we found doors, and even windows that we had never anticipated! I know that the back garden is a dump and that it is full of footballs, tennis balls, beach balls and golf balls; you can blame the skanky neighbours for that. 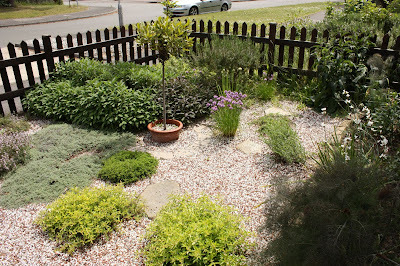 On the other hand, the herb garden at the front of the house, now that I shall really miss – I hope you make the most of it. In case you don't know, there is barely anything out there that you can't eat – and the herbs you can't, you can turn into home remedies! I hope you enjoy living in this house – treat it well! Each of these photos was taken in the first week of Lara's life. Although they are quite peaceful, sentimental images, they bring with them a great wave of joy each time I look at them. ...and Tiny clothes to put them in! These photos are my inspiration for this week's photo gallery at Sticky Fingers. 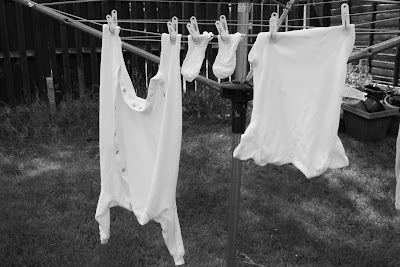 I have been tagged by babyrambles and the 20-Something Mum in the Plastic Joy Award. To accept the award I must identify the 5 fictional characters I would choose to, you know, 'get to know better'! So here are my 5 gentlemen of choice! Rincewind the wizard from the Terry Pratchet Discworld novels... he seems like the cuddly, sensitive sort! I would like to pass this award on to Baby Genie because, as my bloggy twin, I'm fascinated to know who she comes up with! I have Fish-A-Phobia (but I'm learning to deal with it)! This weekend I went with my Mum to the Fish Works cookery school in Richmond. It was a great day out where we learned lots of useful tips about how to buy, prepare, cook and serve a wide range of British fish and seafood. Unfortunately, there was one thing holding me back – I am absolutely terrified of fish. Icthyophobia is the the fear of fish. I have it. Given that I live nowhere near the sea and that, until a few years ago I didn't eat any fish at all, it normally doesn't present me with much of a problem but very occasionally, as it did at the cookery school, it makes my life pretty tricky. My fear of fish can be traced back to an incident with a 'frighten-fish' at the Aquarium in Birdworld when I was a toddler. The first time I really remember knowing that I had an irrational fear of fish was when I was in my mid-teens and I think the fear reached its strongest while I was at University. At its peak, I couldn't even look at a picture (not even a cartoon) of a fish without feeling slightly queasy. If we saw a fishmongers, I would have to turn my face as we walked by and would feel the nausea rising. When I swim in the sea (wherever I am in the world), I am always flailing my limbs around to try and deter any fish from coming anywhere near me – it is very exhausting! As a teenager, a trip on a glass-bottomed boat in Kenya nearly pushed me over the edge! When I left university I dated a guy who was studying Marine Biology – learning with him about the biology of fish and marine creatures helped me a little; Understanding why fish move like they do, and act like they do helps me to keep my fear in check. Dating a marine biologist meant that I also learned to start eating some types of white fish and seafood. I'm still not that adventurous, but maybe I will try some new fish with my new-found fish cookery skills! On a trip to Tenerife with my marine-biology boyfriend, I experienced a panic attack at an Aquarium so severe, and so embarrassing that I knew I really needed to do something about the fear. And so, unbeknownst to him, I enrolled myself in a SCUBA diving course and decided to tackle my phobia head on. The rather unfortunate thing about learning to dive in the UK is that the water is so murky that fish encounters are few and far between; in fact, I think I only saw one tiny brown fish in all my training dives and then I was concentrating so hard on not drowning that it didn't really bother me anyway! The boyfriend didn't seem that impressed with my diving qualification and soon afterwards we split up; the plan to tackle the phobia was put on the back burner. In 2008, just before I got married to Mr. B., I took a SCUBA refresher course in preparation for our honeymoon in Mozambique, home to some of the most spectacular fish and one of the rarest of sea mammals – the Dugong. If there was ever going to be an opportunity to face my fear, this was it. The honeymoon rocked, but the night before my first dive, I stayed awake all night shaking with an all-consuming fear. I had got myself really worked up. That morning, when I slipped into the water with all of my kit on I started hyperventilating; this is not good for several reasons – (1) it uses up your limited air supply, (2) is makes you exhausted (3) short sharp breathes are a sure fire way of making you float, not sink! And (4) it means water gets in to your mouth piece. In short, I never even managed to get under the water! I decided that day that me and SCUBA diving were never meant to be. At Fish Works this weekend I thought I did pretty well. I managed to stand within a metre of a great display of fish for sale and I even plucked up the courage to stroke a slimey flat fish! I stopped short of filleting a mackerel; I knew it would end in tears if I did. For that, I feel slightly disappointed in myself for not having pushed my boundaries a little further. I wouldn't normally recommend a food supplement because there really is no substitute for a healthy balanced diet. But... 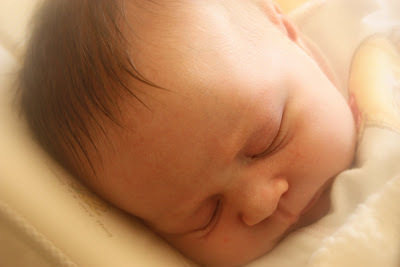 I wanted to let you know about Perfectil (which I discovered by accident) because I have been using it for a month and I'm really happy with the effect it has had in countering the loss of 'mummy glow' I experienced when I gave up breastfeeding in January. Before I fell pregnant, I was taking a multi-vitamin. I do eat a very healthy, generally balanced diet but there are gaps that I try to fill. I hate drinking milk and until very recently, I have not eaten any fish at all. Sometimes, my body just needs a bit of a boost. I stopped taking my multi-vitamin when I became pregnant to ensure that there wasn't too much of any one thing in my system. After I had Lara, there was a big tub of cheap multi-vitamins and a random packet of Perfectil (I have no idea where it came from, probably a prize?) sitting in my bathroom cupboard, looking unloved. Obviously, during breastfeeding I couldn't start taking a supplement again (however drained I felt) but I did briefly trial the Pregnacare breastfeeding supplement for the Mother & Baby awards last summer shortly after Lara was born. It is hard to measure the effectiveness of a food supplement designed to give your baby the best start in life... I'll get back to you in about 16 years and tell you whether it delivered on its promises! In January I gave up breastfeeding. Within one week all of my finger nails had broken. Within two weeks my hair had dulled and I had started to moult more than the blimmin' cat. Within one month of giving up breastfeeding I had developed dry skin and a rash on my arms having never ever suffered from dry skin before in my life. And so, I raided the bathroom cupboard for that box of Perfectil. 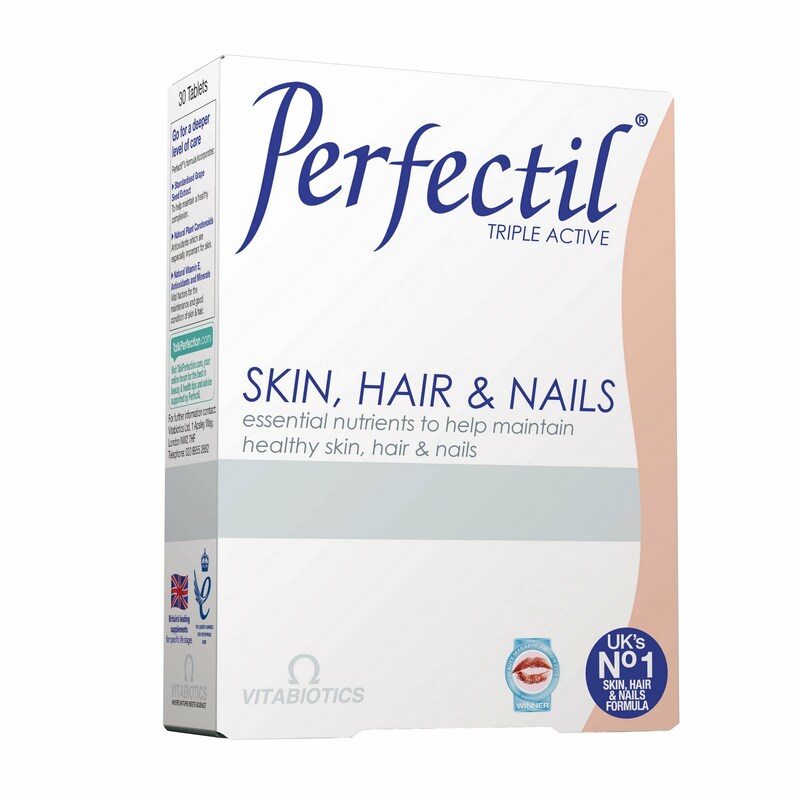 Perfectil is a nutritional supplement for skin, hair and nails. You take a tablet each day with your main meal. The tablet contains 22 nutrients designed to help you gain a clear complexion, glossy hair and strong nails. It provides antioxidant carotenoids to protect skin tissues; plant extracts such as grape seed extract for a healthy complexion and vitamins and minerals for blood circulation and tissue formation. It took a couple of weeks but I did soon notice a change to my finger nails. They are back the way they should be – strong, long and healthily gorgeous. I love my finger nails! I have now been taking Perfectil for a month. My hair may not be the shiny flowing locks they were during pregnancy but I'm certainly not shedding it any more and it doesn't look flat and miserable – just normal. I can't see a significant change in my skin but I'm prepared to wait a while and see what happens. Perfectil is made by Vitabiotics can be found at most major retailers or online for around £8.50 for a month's supply . I've found it to be a great way of re-balancing my skin, my hair and most definitely my nails after the enormous changes that motherhood brings. The inspirational Hayley at Single Motherhood Challenges tagged me a while ago in the 'ten things that make you happy' meme. Lara. When she isn't ill (in which case she makes me sad on her behalf, see here) Lara makes me beam from ear to ear. She rocks. Mr. B. Because he takes me to spas, cooks me great food and is incredibly scrumptious. Chocolate. Preferably dark chocolate, the more expensive the better but in general, I'm not fussy! Wine. Oooh, makes me mellow just thinking about a nice glass of South American or New Zealand fruity goodness. Food in General. Thinking about, preparing, cooking and eating food is the way I de-stress. Getting STUFF done. I find it very rewarding to achieve stuff (even if that stuff is mundane stuff like housework). Getting stuff done makes me feel good about myself. The Sunshine. This time of year is my absolute favourite. It is why I chose to get married in the spring. Yellow flowers feel so... alive and the fresh vibrant greens of spring are made all that more special when the sun shines. Yes, it feels cosy and traditional when the autumn chill arrives here in the UK but I'm definitely a 'sun' person. I was born in the summer and am always happiest in the sun! Smellies. You'll know from my health & beauty reviews that I'm a sucker for cosmetics and smellies. You can't beat a long hot bath full of bubbles accompanied by a row of selected goodies such as body scrubs, shower gels, body lotions and moisturisers. Bliss. Comedy. Laughing makes me happy. The opportunities for live comedy gigs are few and far between now that Lara is here (although it doesn't stop some, see here!) but this year I'm hoping to see one or two. We are already booked in to see Rhod Gilbert later in the year. Cats. Clinically proven to make you happy. My old man Wallace is too lovely for words and even when he comes to wake me up in the morning with a loud brreeeeeeeooooooowwww, he makes me happy! For this meme, I tag Cheeky Mummy whose new blog is up and running and Red Ted Art who I'm sure will have lots of creative happy things up her sleeve! Amy at ' And 1 more means 4 ' is hosting a birth story carnival to get her in the mood for number 5. I've been meaning to write mine for a while, so here it is, the story of how Lara came into the world. It all started on a hot Tursday in June. I was already 6 days overdue. I had been off work for 3 weeks, I had entered EVERY competition on the entire internet. It was hot, my noisy neighbours were doing my nut in (a story for another day) and I was bored and fed up of waiting. I decided to do the thing my midwife had been going on about for months... I got down on my hands and knees and scrubbed the kitchen floor with a scourer. Within an hour I felt the first twinges! That night, I went to bed with great expectations. I woke at 12.30 with the first contractions. Right from the start my contractions were about 5-6 minutes apart. I couldn't sleep so got up and started timing the contractions using ContractionMaster (they also do an Ipod app!). At about 4am the contractions started coming every 3 minutes, they weren't bad, just ehausting at that short an interval. We put the TENS machine on, bounced about the living room on the birthing ball and tried to take my mind off things. At 11am on the Wednesday the contractions were strong and after a long bath and a few Paracetemol, the hospital suggested we come in. The drive to the hospital is 20 minutes and about half-way there, the contractions slowed down. The baby wasn't ready. The examination showed that I was barely dilated and by the time we left the hospital, the contractions had nearly stopped. Obviously, as soon as I got home, things started happening again. I had another couple of long baths and more pills and at about 4 or 5pm I tried to have a sleep. I think I probably managed, through the help of the TENS machine numbing my mind and body, about an hour, maybe more of sleep. When I woke, the contractions were awesome. Mr B. cooked me a meal but I couldn't face eating. I gritted my teeth and tried to bare the pain but at about 9.30pm I rang the hospital and told them I couldn't wait any longer. We arrived at the hospital in the dark and had to make our way around 2 million sides of a square through the night entrance to the delivery suite. When we arrived, there was no room at the inn. I was sent to the day care room for a 'sit down'... er, right. A miserable old bat (after lots of pestering from Mr. B.) brought me a canister of gas & air but it made me gag (reminded me too much of SCUBA diving, another story I will tell you at some point). We finally got a delivery suite at about 11.30pm and an examination showed I was over 7cm dilated. I asked to use the birthing pool and I was in the warm, relaxing water by midnight. The birthing pool was great. I would highly recommend it and will certainly give it a go again next time. I am at my most relaxed in water and knew that I wanted to try a water birth. The labour progressed slowly but the water meant I was calm and relaxed. I don't think a single swear word passed my lips. At some point around 4am my waters broke (which is a weird sensation when you are yourself in water!). There was maconium in the discharge which (a) indicated that the baby was getting stressed and (b) meant that the pool had to be drained. I got out, lay down on a bed and realised quite how much pain-relief the water had been giving me... outside the water the pain was unbearable. An examination showed I was fully dilated and that the baby seemed fine so I was allowed to get back in the water and start pushing. I have no idea how long I was pushing for but I know that I wasn't progressing (and that I was doing my own body a lot of damage in the process). The midwife noticed that the baby's heart rate was escalating and insisted I leave the pool. I was tired, exhausted and I wanted it all to be over. From this point onwards, it is all a bit of a blur, I was just so shattered. I lay down on a bed because I didn't have the energy to do otherwise. I was hooked up to a heart-rate monitor and advised by a doctor to accept a Syntocinon drip to increase the contractions. Because I had not had any other pain relief, I was told that I was unlikely to be able to take the pain that the Syntocinon-induced contractions would bring so I was also offered an epidural. At this point I was so tired I really just wanted the whole thing to be finished. I took the drugs, had a great big needle inserted into my spine and tried to forgive myself for having not managed the water birth. Myself and Mr. B. were left to have a sleep while the drugs took hold. When the midwife shift changed I was very emotional; the previous midwife gave me a kiss and wished me luck. The new midwife came in and cranked the drip up to 11. A little while later, the contractions started coming thick and strong but also the baby's heart rate went the roof. The next few minutes were the most surreal of my life. A doctor examined me and found the baby to be wedged sideways in th ebirth canal. All hell broke loose. Doctors, midwives, anaesthetists, tea-ladies... everyone came into the room. I was handed sheet upon sheet of paper that read me my rights and asked for signatures. I was recommended for an emergency caesarean but thankfully the midwife managed to talk some sense into the doctor who agreed to attempt an assisted delivery first. The epidural was topped up, I was heaved onto a trolley and rushed into the operating theatre. As the drugs took hold I started to shiver. The shakes were so severe that I was bouncing around on the table. 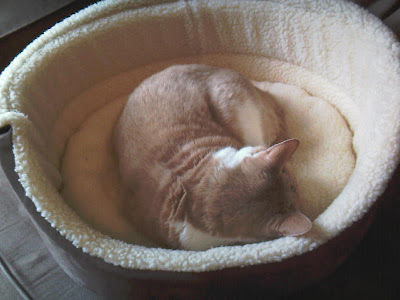 I remember feeling very calm, in total contrast to Mr. B. who was panicking on my behalf. 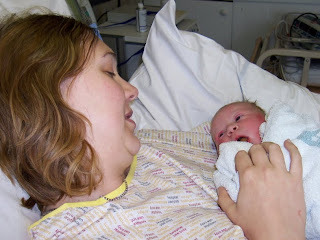 The drugs, the shakes, the bright lights, the total randomness of the whole situation in comparison to my birth plan... it all built up and I got the giggles! The doctor attempted a vonteuse delivery. It failed. They then made an incision and attempted a forceps delivery – the last option before a c-section. After a lot of yanking, the baby finally came free! Lara was born at 8.59am on Thursday. At 8lb 12oz she was placed on my belly and the giggles turned to laughter, then to tears, and then more laughter. The forceps delivery left a mark on Lara's face for a week or so, but it doesn't seem to have done her any lasting damage. The labour was hard work but I wouldn't have done it any differently other than waiting longer to attempt the initial hospital run. I just have to hope that if/when the next time comes, the labour will be shorter and easier. 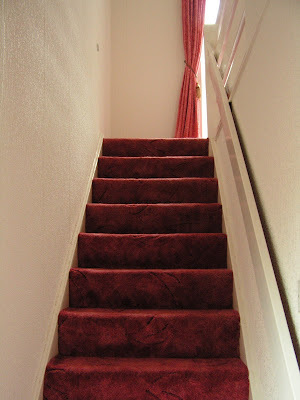 While trawling through my photo collection trying to find something to fit the 'Ugly' theme for this week's photo gallery at Sticky Fingers, I came across a photo of our stairwell taken on the day we moved in (almost exactly 5 years ago) - it actually made Mr. B. exclaim, "ugly carpet"; so that was it, decision made. I know its not a very exciting picture but its a fitting way for me to start telling you about our slow first steps towards moving house this year. 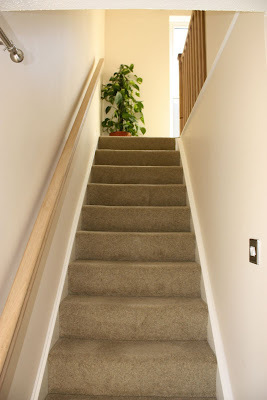 It took us over 3 years to get rid of that ugly bright pink, thick-pile, dog-hair-laden carpet! As it turned out, it was the very last bit of the house that we got around to decorating. After 3 years, the day that we ripped it out was a day of celebration (and the day our house no longer smelled of someone else's dog). We finished decorating the hallway just after I became pregnant with Lara. In fact, it was when I was at the top of a ladder painting the ceiling that it dawned on me that the feelings of nausea I was experiencing may not have been entirely down to paint fumes. And this is the finished product... much more pleasing, I'm sure you'll agree. Now that we have finished decorating the house, and now we've had a year to enjoy it in its completed state, it is of course time for us to move on! Over the coming months I'll be posting more about our move but for the time being we just have to make the house presentable which is easier said than done when you have a 9-month old baby wreaking havoc throughout the place. 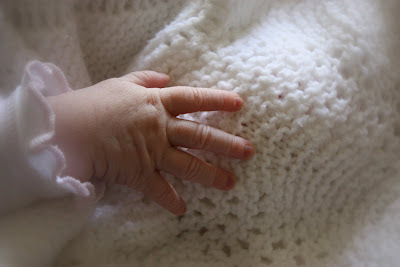 I read a great post last week at Bumbling Along about the realisation that your baby is an individual and that when it comes to their development and their behaviour, no one child is the same and that it really doesn't matter if they don't conform to the 'norm', in fact, it makes them all the more loveable. Last week Lara had her 9-month check at the baby clinic. Sitting in a room full of babies all within 5 weeks of each other in age really brought this home to me. Some of the babies were crawling all over the shop while others could barely sit up unaided. Some had a mouth full of teeth, others had none, and no sign of them. There were babies who were still on a diet of 100% breast milk, and others who, like Lara, are well on their way to eating a full, unrestricted diet of 'real' foods. In the current age of online motherhood communities and self-help books, you can be bombarded with information about what your baby “should” be doing or eating at their current stage in life. As a first time mum it's helpful to have such a wealth of information available to me to help answer my questions about bringing up a baby and to demystify the world of motherhood but they can also be misleading and can build unreasonable expectations. Although I have shunned all of the self-help parenting books, I do subscribe to email newsletters from all the big mummy networks and many of the big brand baby product suppliers; I have done right from the beginning of my pregnancy. During pregnancy I would receive about 3 emails each week telling me what to expect at the current stage of proceedings. Most weeks they were shockingly accurate... but then when an email didn't quite explain what I was feeling, or else told me about something I wasn't yet experiencing I began to worry – maybe the pregnancy wasn't progressing correctly? It is the same with child development emails. When Lara was about 3 months old I started receiving emails about how my baby will soon start to roll. After a few weeks I began to worry and then when all Lara's peers started to roll I felt a little left out! Lara still doesn't roll (which seemed to surprise the health visitor at the 9-month check) – she doesn't need to. Lara can get about just fine without rolling. But now I realise that it really doesn't matter whether she's the only one who doesn't roll over. Maybe she'll do so in her own time, maybe she'll never bother. There are things Lara does which nobody else's babies do yet but hey, who really cares? I strongly feel that the sooner you accept that your baby is unique and will do things at their own pace, the sooner you can relax as a parent and grow in your own confidence. Celebrate the things they can do, deal with the ways they do behave, feed them the things they will eat. Do it your way – its the best way. You'll know, if you've read any of my other posts on weaning, that I'm a mummy who really wants to offer Lara great home-cooked food whenever I can. As well as mummy-ing and blogging, I also work 9-5.30 during the week and I have found it hard to provide both of my childminders with a home-cooked main meal for my weaning daughter, as well as healthy snacks throughout the day. These days I am always on the lookout for convenient, healthy snacks to put in Lara's lunchbox. Firstly, I get all of my fruit & veg delivered on a Monday in an organic box by Abel & Cole. Sometimes the box doesn't contain anything suitable to give to Lara, on other occasions the box will contain fruit that isn't really ripe until later in the week. I always like to have a few sachets or pots of fruit on hand for these situations. On weeks such as this one, when Lara is teething, she really doesn't fancy gnawing on a slice of pear or chomping on a piece of mango. All she wants is something easy and sloppy that won't tax her gums too much. This week, the Goodies Squeezies have been a lifesaver – when she has refused all the other things I have put in front of her, she has gulped down her Squeezies. Phew. And finally, the Goodies Squeezies pouches offer a wide range of different flavours compared to the range of fresh fruit I am likely to have around the house at any one time. Designed for toddlers from 12 months upwards, they have adventurous flavour combinations such as Mango, Pear & Orange or Banana, Pear and Kiwi. The purées are a lot thinner in consistency than other fruit purées I have tried but that's a good sign – it means that there are no thickening agents in there. It also means that they are suitable for babies from as young as 4 months (or whenever you choose to start weaning). The pouches make a fun snack - they are squeezable so that older children can grab them and feed themselves. They are also resealable (you can finish them up within 24 hours). The pouches are made from a sturdy material that means I can shove them in Lara's lunchbox and not worry about them bursting or coming unstuck (which has happened with some fruit pots and yoghurts – ick); unfortuately that means that the packaging is non-recycleable... something I personally feel that an organic food company should be looking to address. 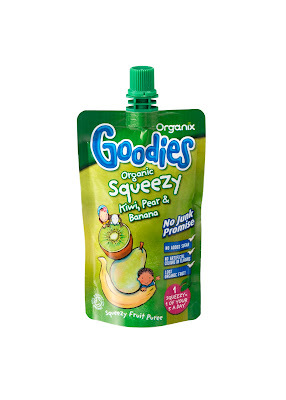 The Goodies Organic Squeezies by Organix (100g) are available from around 89p. You can find out more about Organix on their website http://www.organix.com/ . What would you be doing right NOW if you weren't reading this blog post? What would I be doing right NOW if I weren't writing this blog post? I am supposed to be creating a new website for a friend and each evening, once Lara is asleep, I sit down and start work at the laptop only to be drawn back into the world of blogging – somehow writing real words seems more cathartic in my evenings than writing code (which is, after all, what I do all day). My complete inability to concentrate on the website rather than the blog made me wonder what I would normally have been doing at the times when I now blog. Friday nights are usually reserved for tasty (normally easy) food, good wine (and a few aperitifs!) and plenty of television. On a normal week (i.e. not a bank holiday weekend), Friday is the night when we chill out and try not to worry about the huge number of jobs we have to do over the weekend, and try to forget about the stresses of work. In the past I would have spent the whole evening with a drink in my hand, vegetating in front of the television. Now, I drink less (partly due to the new year's diet resolution to lose weight, partly due to the fact that if I drink huge amounts then the blog writing doesn't go that well! ); so that's good news – blogging makes you healthier. The TV is still on but I just don't pay very much attention to it! I know that Mr. B. has developed an alarming interest in Embarrassing Bodies on channel 4 but I wouldn't be able to tell you what else is on each Friday night. Another plus – blogging stops you from being a TV junkie. The other thing I like to do on a Friday night is to curl up on the sofa with Mr B. and have a snuggle. Blogging does rather get in the way of that. Hmmm, blogging certainly reduces snuggling opportunities.... must sort that out. 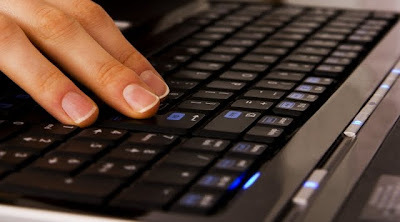 So, tell me, what would you be doing right now if you weren't reading/writing blogs? 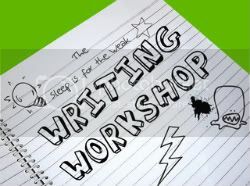 This poem was written for this week's writing workshop at Sleep Is For The Weak. I took prompt 5 and have written about how I felt when I first suspected I was pregnant with Lara. It turns out to be quite a common theme! A cloud of exhaustion has greyed my day. What if I'm wrong, what'll he say? This all-consuming anxiousness won't lift. For a sheepish purchase – I make it swift. Locked in the bathroom – I feel so alone. I pee on a stick, take a breath and calm down. On life with just 'us' as I study that clock. Uncontrollable giggles and a smile I can't block. Well that's that. We did it! Hurry home Mr. B. - I NEED to share. What now? Where to start? The wanting is over, now I've 9 months to prepare!